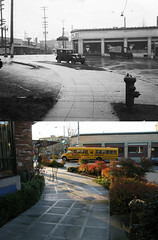 In 1903 the area centered at 23rd and Union in Seattle was transformed with the addition of direct streetcar service. Today the area lacks a simple name, but for several decades it went by the name of that line: the East Union neighborhood. Homes nearby East Union Street initially were purchased by families expecting to commute after a walk to Madison or Cherry streets. The first line to open nearby was the Madison Park Cable line in 1890. It connected to a park getaway on Lake Washington, but also opened up farms and woodlands directly to the heart of Seattle. The area changed rapidly. One of the first families to make the move was William Grose with his wife and children. Histories of Grose are conflicting and imprecise, but they agree that he was living at a new home at 24th and Madison in 1890. It must not be a coincidence that the cable car opened that year. In 1892 the area was trapped in a right triangle by the Madrona Park line of the Union Trunk Line system. 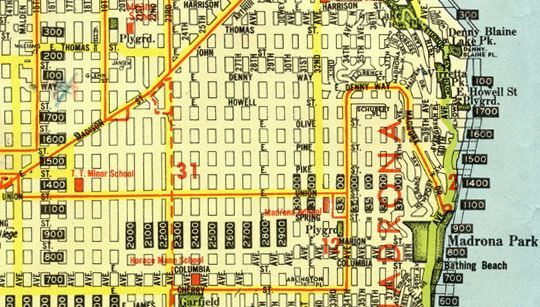 With the Madison Park line as the hypotenuse on Madison Street, the Madrona Park line came east on Cherry Street and then north on 34th. Riding the Madrona Park streetcar meant transferring to the James cable car at Broadway in order to get into town. In 1899 the Seattle Electric Company (SEC) began buying up street railways and cable cars in Seattle, including the Madison cable and the Union Trunk Line system. After the one-year binge was over, they held all but just a few lines. In the midst of all of this turmoil, John Frink and several partners acquired a new streetcar franchise to run a car from the wholesale district south of Pioneer Square out to 12th and 14th Avenues and then north to Volunteer Park. The franchise was awarded in February 1900 (Ordinance 5830) and they later transferred the franchise to their company, the Seattle Central Railway (SCR). The line opened for service at the start of February 1902 and two weeks later was sold to Jacob Furth, the head of SEC. SEC officially acquired SCR on January 13, 1903. In addition to directly serving Volunteer Park on the east side, SEC would be able to link their stranded Madrona streetcar up to the network. SEC filed for a vast amendment to the Frink line franchise, discontinuing use of many streets in the south end that were redundant and creating a spur out East Union Street to 29th Avenue East (Ordinance 9035, Dec 1902). The spur is the focus of this article. The East Union spur did not operate as a part of the old north-south Frink line. Instead, it linked through Broadway to tracks on newly regraded Pike Street and then south on 2nd Avenue through Pioneer Square to Washington Street. After working with the community to plan and repave the road, SEC quickly built the tracks starting in November 1903 and began service on December 13, 1903. Initially the line would only be built on East Union to 25th Avenue. In 1904 SEC continued construction, completing a loop on Columbia and 15th and extending the line out to 29th. This fulfilled the requirements of the franchise issued by the city. With the introduction of the streetcar line, the neighborhood apparently established an identity for the first time. No longer simply an inconvenient mid-point between two transit systems, the area west of Madrona began to be called the “East Union District”. Likely this was taken from the destination name on the streetcars, much like the North Broadway neighborhood acquired its name. This term first appeared in the Seattle Times in 1906, three years after service began. Initially it was used as head-line eye-catchers in real estate listings. It was a unique neighborhood, often appearing alongside its neighbors such as “Madrona and East Union Districts”, “Renton Hill and East Union Districts” or “Madison and East Union Districts”. After several political attempts to get the City of Seattle directly involved in streetcar operations, in 1918 voters approved purchase of the entire Seattle Electric Company system. The next year the Seattle Municipal Railway extended the East Union Line out to 34th Avenue, linking with the Madrona line. This required widening Union Street from 30 to 42 feet to accommodate tracks. At some point after Union was linked to 34th, there was a change in routing. It may have been immediate in 1919. To cut travel times, the East Union line took over service through Madrona and down to Lake Washington, just as the #2 Metro bus does today. East Cherry service ended in Madrona, again carried on today as the #3 Metro bus. By the 1930s these were respectively the #8 Madrona and #11 East Cherry streetcar lines. On February 22, 1940 Seattle received its first “trackless trolley”, what we refer to as a trolley bus or electric bus today. They set up a test course on 14th Avenue from Jefferson to Union, to confirm that the buses would operate as expected. Streetcar service had already ended on the #8 Madrona line through East Union Street. On February 18 diesel buses began temporary service, running 32-passenger yellow buses. These were replaced with another temporary measure on March 24 with 41-passenger buses burning regular gasoline. After several months of combustion engine use, the Madrona line on East Union street was the fourth to be converted to trolley bus. Service started on May 3, 1940 with a temporary diesel shuttle bus down to the lake. Sunday, June 2, 1940 the electric service connected through to the lake. Although the Madrona line service did not change much, other routes had dramatic readjustments with the switch from streetcar to bus. Seattle Transit addressed this by renumbering the entire system. The #8 Madrona streetcar became the #2 Madrona electric trolley bus. Every now and then the name “East Union area” or “East Union neighborhood” will appear in a paper, but for the most part the blocks from Cherry to Madison are simply referred to as the Central Area today. During the peak of the Civil Rights movement in the 1960s and 1970s it was often described as the Minor-Mann Neighborhood, drawing from the names of two schools in the neighborhood. A day after I started writing this article Ryan Parker published a spotlight on Metro’s #2 bus for the Capitol Hill Seattle Blog. It’s a funny coincidence because my history of Roanoke Park streetcar service preceded his spotlight on the #49, the bus descendent of that line, by three days. Ryan wins this time but only by a half day. Ryan’s discussion of both the present and a possible future for the #2 is worth reading. While service on East Union seems safe for the foreseeable future, other parts of the route could change again. On CHS, a history of the 1906 municipal streetcar plan, with focus on Summit streetcar service. On Seattlest (link to archive.org), my first attempt at describing streetcar service on Capitol Hill. It has many mistakes. “Walla Walla Playfield” where Garfield is now! By the way, the 98122 post office at the corner of 23rd and Union is, I believe, still called the East Union station.